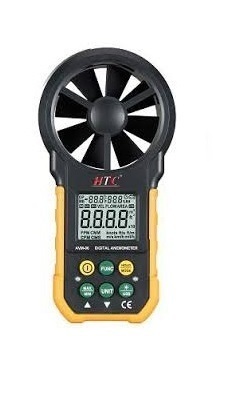 HTC make Anemometer Model AVM-06 is used for ambient temperature, humidity, dew point. temperature, wet bulb temperature, wind speed. and air volume. Large-screen LCD and backlight. Standout features include Data Hold. Auto Power OFF. USB real time data uploading functions. Supplied with battery, hard carrying case, manual, Software CD, USB Cable.